^ "Recent Indus Discoveries and Highlights from Excavations at Harappa 1998-2000". www.harappa.com. Retrieved 2019-03-31. ^ "Mohenjo-daro!". 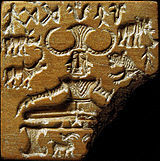 www.harappa.com. Retrieved 2019-03-31. ^ "Sumra family". Britannica Online. Retrieved 2019-01-20. ^ Mirza, Abbas (2014-10-29). TOPPERS' NOTES for CIVIL SERVICES EXAMINATION. Abbas Mirza. ^ "Effects of Mahmud's Invasions on India". History Discussion - Discuss Anything About History. 2014-11-29. Retrieved 2019-04-02. ^ Bosworth, C. Edmund (2007-12-26). Historic Cities of the Islamic World. BRILL. ISBN 9789047423836. ^ "Delhi sultanate | Muslim kingdom, India". Encyclopedia Britannica. Retrieved 2019-04-02. ^ "DELHI SULTANATE – Encyclopaedia Iranica". www.iranicaonline.org. Retrieved 2019-04-02. ^ Qureshi, Tania (2018-08-02). "Qutbuddin Aibak: The forgotten tomb of a slave sultan". Daily Times. Retrieved 2019-04-02. ^ Banarsi Prasad Saksena (1992) . "The Khaljis: Alauddin Khalji". In Mohammad Habib and Khaliq Ahmad Nizami. A Comprehensive History of India: The Delhi Sultanat (A.D. 1206-1526). 5 (Second ed.). The Indian History Congress / People's Publishing House. OCLC 31870180. ^ Khawaja, Ghulam Hussain (2018-02-21). "15th century Jam Nindo tomb at Makli crumbling". DAWN.COM. Retrieved 2019-04-02. ^ "Indo Islamic culture | Sufism | Hindu". Scribd. Retrieved 2019-04-02. ^ Patel, Alka; Leonard, Karen (2011-12-07). Indo-Muslim Cultures in Transition. BRILL. ISBN 9789004218871. ^ "Islam and Indian Culture". History Discussion - Discuss Anything About History. 2015-01-16. Retrieved 2019-04-02. ^ Shah, Dr Syed Talha (2018-12-23). "HISTORY: THE HERITAGE OF THE SLAVE SULTAN". DAWN.COM. Retrieved 2019-04-02. ^ Kumar, Sukrita Paul (2015-09-03). "The language of many tongues". The Hindu. ISSN 0971-751X. Retrieved 2019-04-02. ^ "part2_10". www.columbia.edu. Retrieved 2019-04-02. ^ "10 facts you should know about GT Road | Samaa Digital". Samaa TV. Retrieved 2019-04-02. ^ "India - The Sikhs in the Punjab". Encyclopedia Britannica. Retrieved 2019-04-02. ^ "The Mughal Legacy". www.edwebproject.org. Retrieved 2019-04-02. ^ "Mughal Architecture in Lahore". The Nation. 2014-01-25. Retrieved 2019-04-02. ^ "Architecture in Pakistan: A Historical Overview". All Things Pakistan. 2009-02-02. Retrieved 2019-04-02. ^ "When Marathas had face-off with Sikhs in Punjab - Times of India". The Times of India. Retrieved 2019-04-02. ^ "Ranjit Singh: A Secular Sikh Sovereign by K.S. Duggal. ''(Date:1989. ISBN 8170172446'')". Exoticindiaart.com. 3 September 2015. Retrieved 2009-08-09. ^ Brown, Kerry (2002-09-11). Sikh Art and Literature. Routledge. ISBN 9781134631360. ^ "Top 4 Causes of the Revolt of 1857 In India". History Discussion - Discuss Anything About History. 2014-07-31. Retrieved 2019-04-04. ^ "British Raj | History of Ancient Pakistan". Retrieved 2019-04-04. ^ "Pakistan Times | Op-Ed: Two-Nation Theory Exists". web.archive.org. 2007-11-11. Retrieved 2019-04-04. ^ "1947 Indian Independence Act". UK Parliament. Retrieved 2019-01-25. ^ "Independence Day Of Pakistan: Its History and Celebrations". web.archive.org. 2012-08-16. Retrieved 2019-04-04. ^ P L Kessler (2018-02-22). "Kingdoms of South Asia - Kingdoms of the Indus / Sindh". Historyfiles.co.uk. Retrieved 2018-08-15. ^ "The History of Pakistan: The Kushans". www.kushan.org. Retrieved 2017-04-30. ^ "KARTIR – Encyclopaedia Iranica". www.iranicaonline.org. Retrieved 2019-01-16. ^ "INDIA iv. 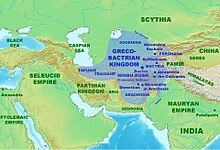 RELATIONS: SELEUCID, PARTHIAN, SA – Encyclopaedia Iranica". www.iranicaonline.org. Retrieved 2019-01-16. ^ a b c Centre, UNESCO World Heritage. "Fort and Shalamar Gardens in Lahore". UNESCO World Heritage Centre. Retrieved 2018-12-13. ^ Stanley A. Wolpert (1988). "The Indian National Congress in Nationalist Perspective". In Richard Sisson. Congress and Indian Nationalism: The Pre-independence Phase. University of California Press. pp. 25–. ISBN 978-0-520-06041-8. 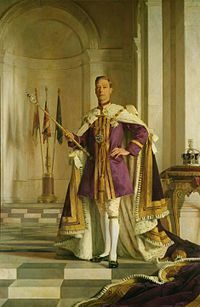 For five years the League remained thoroughly loyalist to and fully supportive of British rule until King George V announced the revocation of Bengal's partition at his coronation Durbar in Delhi in December 1911. 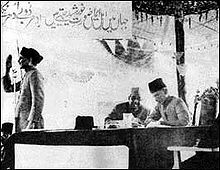 The Muslim League viewed that reversal of British policy in Bengal as a victory for "Hindu terrorist tactics". ^ "Rule of Congress Ministries | The Government of India Act of 1935 was practically implemented in 1937". Story Of Pakistan. 2003-06-01. Retrieved 2019-04-02. 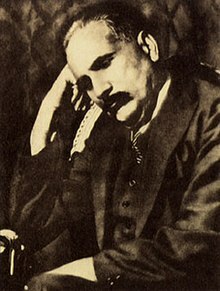 ^ "Was Pakistan sufficiently imagined before independence? – The Express Tribune". The Express Tribune. 23 August 2015. Retrieved 2017-03-08. ^ a b c Ashraf, Ajaz. "The Venkat Dhulipala interview: 'On the Partition issue, Jinnah and Ambedkar were on the same page'". Scroll.in. Retrieved 2017-03-08. ^ InpaperMagazine, From (2014-08-31). "Exit stage left: the movement against Ayub Khan". DAWN.COM. Retrieved 2018-09-01. ^ "Pakistani students, workers, and peasants bring down a dictator, 1968–1969 | Global Nonviolent Action Database". nvdatabase.swarthmore.edu. Retrieved 2018-09-01. The history of Kashmir is intertwined with the history of the broader Indian subcontinent and the surrounding regions, comprising the areas of Central Asia, South Asia and East Asia. Historically, Kashmir referred to the Kashmir Valley. Today, it denotes a larger area that includes the Indian-administered state of Jammu and Kashmir, the Pakistan-administered territories of Azad Kashmir and Gilgit–Baltistan, and the Chinese-administered regions of Aksai Chin and the Trans-Karakoram Tract. 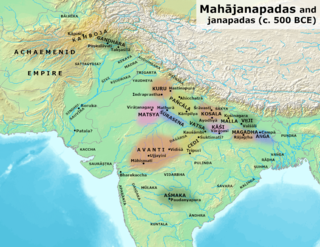 Gandhāra was an ancient state, a mahajanapada, in the Peshawar basin in the northwest portion of the ancient Indian subcontinent, present-day Afghanistan and Pakistan. The center of the region was at the confluence of the Kabul and Swat rivers, bounded by the Sulaiman Mountains on the west and the Indus River on the east. The Safed Koh mountains separated it from the Kohat region to the south. This being the core area of Gandhara, the cultural influence of "Greater Gandhara" extended across the Indus river to the Taxila region and westwards into the Kabul and Bamiyan valleys in Afghanistan, and northwards up to the Karakoram range. Gandhara was one of sixteen mahajanapadas of ancient India mentioned in Buddhist sources such as Anguttara Nikaya. During the Achaemenid period and Hellenistic period, its capital city was Pushkalavati, modern Charsadda. Later the capital city was moved to Peshawar by the Kushan emperor Kanishka the Great in about AD 127. 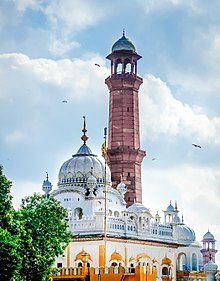 The History of the Punjab concerns the history of the Punjab region the Northern area of the Indian Subcontinent that is split between the modern day countries of India and Pakistan. Historically known as Sapta Sindhu, or the Land of Seven Rivers, only two rivers Sutlej and Beas flow through Punjab state in India. The third river Ravi flows partially in Punjab, mainly along the international boundary of India and Pakistan and then enters Pakistan. The other two rivers Chenab and Jhelum flow in the Punjab state in Pakistan. All these five rivers are tributaries of Indus river. All these five rivers finally merge into Indus river directly or indirectly and the Indus then terminates into Arabian Sea near Karachi city in Pakistan. The name Punjab was given by later Muslim conquest in the Indian subcontinent. Ancient Punjab region was the primary geographical extent of the Indus Valley Civilisation, which was notable for advanced technologies and amenities that the people of the region had used. 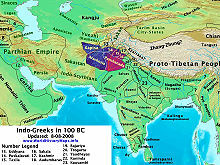 The region was historically a Hindu-Buddhist region, known for its high activity of scholarship, technology, and arts. 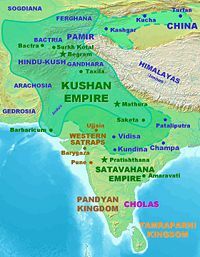 Intermittent wars between various kingdoms was characteristic of this time, except in times of temporary unification under centralised Indian Empires or invading powers. Hinduism in Afghanistan is practiced by a tiny minority of Afghans, believed to be about 1,000 individuals who live mostly in Kabul and other major cities of the country. The history of Sindh or Sind is intertwined with the history of the broader Indian subcontinent and surrounding regions. Sindh was at the center of the Indus Valley civilization, one of the cradle of civilization; and currently a province of modern-day Pakistan. Pakistan is home to many archaeological sites dating from Lower Paleolithic period to Mughal empire. The earliest known archaeological findings belong to the Soanian culture from the Soan Valley, near modern-day Islamabad. Soan Valley culture is considered as the best known Palaeolithic culture of Central Asia. Mehrgarh in Balochistan is one of the most important Neolithic sites dating from 7000 BCE to 2000 BCE. The Mehrgarh culture was amongst the first culture in the world to establish agriculture and livestock and live in villages. Mehrgarh civilization lasted for 5000 years till 2000 BCE after which people migrated to other areas, possibly Harappa and Mohenjo-daro. Harappa and Mohenjo-daro are the best known sites from the Indus Valley civilization.